1. Describe the relationship of postural development and functional motor skills. 2. Describe the relationship of low tone to the development of postural control. 3. Describe the principles of neurodevelopmental treatment to fluctuating tone. 4. Describe the importance of establishing trunk control. 5. Describe combining craniosacral therapy and neurodevelopmental treatment as an approach for function. 6. 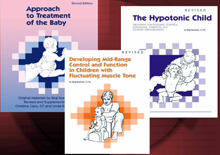 Describe treatment approaches to improve lower extremity function in children with hypotonia.